Jean Maurice Eugène Clément Cocteau (July 5, 1889 – October 11, 1963) was a multi-talented French poet, novelist, dramatist, designer, boxing manager, and filmmaker. His versatile, unconventional approach and enormous output brought him international acclaim; however, Cocteau never let his fame change his poetic and musical philosophy, which was to produce works from a subconscious mind that resulted in unique incongruous arrangements of poetry and music. These works became Cocteau's spiritual reality to be enjoyed on earth so that he and his audiences would be prepared for life in the spiritual world. Cocteau was born on July 5, 1889, in Maisons-Laffitte, a small town near Paris, to Georges Cocteau and his wife, Eugénie Lecomte, a prominent Parisian family. His father was a lawyer and amateur painter, who committed suicide when Cocteau was nine. At the age of fifteen, Cocteau left home after being expelled from private school. Although he wasn't a particularly good student, he usually got by on sheer cleverness and charisma. He fled to Marseilles, where he lived under an assumed name. Despite his achievements in virtually all literary and artistic fields, Cocteau insisted that he was primarily a poet and that all his work was poetry. He published his first volume of poems, Aladdin's Lamp, at nineteen. Soon Cocteau became known in the Bohemian artistic circles as "The Frivolous Prince"—the title of a volume he published at twenty-one. 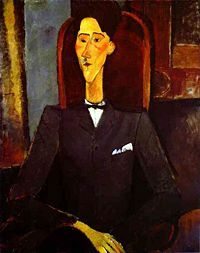 Edith Wharton described him as a man "to whom every great line of poetry was a sunrise, every sunset the foundation of the Heavenly City…"
In his early twenties, Cocteau became associated with Marcel Proust, André Gide, and Maurice Barrès. The Russian ballet-master, Sergei Diaghilev, challenged Cocteau to write for the ballet—"Astonish me," he urged. This resulted in The Blue God, which flopped. Diaghilev gave Cocteau another chance, which led to Parade in 1917. Cocteau was given a dream team, as it was produced by Diaghilev, designed by Pablo Picasso, and composed by Erik Satie. Previously, Cocteau had written material for an unproduced ballet, David, which Igor Stravinski was to write the music for. Some remnants from this, and a prose piece, Potomak, found their way into Parade. Guillaume Apollinaire coined the word "surrealism" to refer to the production, which was not well-received. "If it had not been for Apollinaire in uniform," wrote Cocteau, "with his skull shaved, the scar on his temple and the bandage around his head, women would have gouged our eyes out with hairpins." Nonetheless, Cocteau was an important exponent of Surrealism, and he had great influence on the work of others, including the group of composer friends in Montparnasse known as Les Six, which consisted of Georges Auric, Louis Durey, Arthur Honegger, Darius Milhaud, Francis Poulenc, and Germaine Tailleferre. Cocteau published some of their musical scores as his publishing house, Editions de la Sirene. After World War I, Cocteau finally found success on the stage with several neoclassical plays, Antigone being the first and most successful. Le Groupe des Six, 1922, by Jacques-Emile Blanche. In the center, pianist Marcelle Meyer; from bottom to top: Germaine Tailleferre, Darius Milhaud, Arthur Honegger, Jean Wiéner; on the right: Georges Auric, Francis Poulenc, Jean Cocteau. Here pianist Jean Wiéner replaces Louis Durey who left the group in 1921. Cocteau was openly homosexual, though he had a few brief and complicated affairs with women. He published a considerable amount of work criticizing homophobia. In 1918, he met the 15-year-old poet Raymond Radiguet. The two collaborated extensively, socialized, and undertook many journeys and vacations together. Cocteau also got the youth exempted from military service. In admiration of Radiguet's great literary talent, Cocteau promoted his friend's works in his artistic circle and also arranged for the publication by Grasset of Le Diable au corps (a largely autobiographical story of an adulterous relationship between a married woman and a younger man). Cocteau exerted his influence to help Radiguet receive the Nouveau Monde literary prize for the novel. There is disagreement over Cocteau's reaction to Radiguet's sudden death in 1923 due to typhoid fever. Some claim that it left him stunned, despondent and prey to opium addiction. Opponents of that interpretation point out that he did not attend the funeral (he generally did not attend funerals) and immediately left Paris with Diaghilev for a performance of Les Noces by the Ballets Russes at Monte Carlo. Cocteau himself much later characterized his reaction as one of "stupor and disgust." His opium addiction at the time, Cocteau said, was only coincidental, due to a chance meeting with Louis Laloy, the administrator of the Monte Carlo Opera. Cocteau's opium use and his efforts to stop profoundly changed his literary style. In the 1930s, Cocteau had an unlikely affair with Princess Natalie Paley, the beautiful daughter of a Romanov grand duke and herself a fashion-plate, sometimes actress, model, and former wife of couturier Lucien Lelong. She became pregnant. To Cocteau's distress and Paley's life-long regret, the fetus was aborted. Cocteau's longest-lasting relationships were with the French actors Jean Marais, whom he cast in Beauty and the Beast and Ruy Blas, and Edouard Dermit, whom Cocteau formally adopted. Cocteau is also rumored to have carried on a relationship with Panama Al Brown, a boxer he managed during the 1930s, but no documented evidence of this relationship exists. Cocteau's most famous piece of work is his novel, Les enfants terribles, about a brother and sister growing up and trying to disconnect themselves from the world. Les Enfants Terribles was written in a week during a strenuous opium weaning. After being hospitalized for opium poisoning in 1929, he published Opium: The Diary of an Addict in 1930. Cocteau released his first film in 1930, The Blood of a Poet. The filming of this piece was disrupted by bad luck and bad chemistry with his crew. A true auteur, few others understood what Cocteau's vision was. They also became restless after he pushed his actors and crew to extremes. Cocteau had a way with dealing with bad luck, though. When an actor broke his ankle on set, the character he portrayed was made to have a limp. If a scene could be filmed, Cocteau saw to it that it happened. The film was met with outrage, particularly because of a pair of shots showing the death of a boy and the suicide of the titular poet. He was ordered to refilm the scenes, and eventually the film's distribution license was revoked despite Cocteau complying. An inferior print was later released. After years of fighting his opium addiction, Cocteau finally returned to make another film; an adaptation of Beauty and the Beast. He looked to Jean Marais—whom acted in most of Cocteau's plays and films, to the point where Cocteau wrote parts for him—to play Beast. As Cocteau's film diary shows, it was still a turbulent set and Cocteau spent much of the time trying to maintain his dignity and hide his mistakes. He often questioned his ability as a film director, mostly due to lack of experience. Poor weather slowed production, and scenes were cut due to actor availability. Cocteau and his crew persevered, though, and the film was a stronger success than his previous effort. Adapted from his own 1938 play, both the film and the play gained notoriety for its overt sexuality. It is a melodrama about a son who wants to run off with his father's mistress. As far as his films are concerned, Cocteau was most famous for this and Beauty and the Beast. Both films featured Jean Marais. Although there was inevitable protest of its sexually charged plot, Les parents terribles was certainly a forerunner of French New Wave cinema, abandoning traditional shot coverage for shots that were long in duration. Orpheus was another film staring Jean Marais, and continued along Cocteau's repeating themes of his career: Mythology, poets, and death. Although he has replaced Orpheus, the musician of Greek mythology, with a poet, the plot of a man following his deceased wife to the underworld remained. And, as the myth goes, he was allowed to return with her under the condition that he not look at her. Although, in Cocteau's adaptation, Orpheus may never look at his beloved Celeste. The Testament of Orpheus was Cocteau's final film, and the first film since his debut, Blood of a Poet, to not feature Marais. Rather, Cocteau himself took on the role of Orpheus, the poet, in tune with his sentiment that, above all else, he was a poet—and that all the art he created was also poetry, first and foremost. Statue of Jean Cocteau in Villefranche-sur-Mer, France. In 1940, Le Bel Indifférent, Cocteau's play written for and starring Édith Piaf, was enormously successful. He also worked with Picasso on several projects and was friends with most of the European art community. Cocteau's films, the bulk of which he both wrote and directed, were particularly important in introducing Surrealism into French cinema and influenced to a certain degree the upcoming French New Wave genre. In 1955, Cocteau was made a member of the Académie française and The Royal Academy of Belgium. Cocteau died of a heart attack at his chateau in Milly-la-Foret, France, on October 11, 1963, at the age of 74, only hours after hearing of the death of his friend, the French singer Édith Piaf. He is buried in the garden of his home in Milly La Foret, Essonne, France. The epitaph reads "I stay among you." During his life, Cocteau was commander of the Legion of Honor, Member of the Mallarmé Academy, German Academy (Berlin), American Academy, Mark Twain (U.S.) Academy, Honorary President of the Cannes film festival, Honorary President of the France-Hungary Association, and President of the Jazz Academy and of the Academy of the Disc. This page was last modified on 1 May 2018, at 20:28.